Walking east along Blanquerias from the Torres de Serranos it would be easy to pass number 23 with barely a glance. The dark, modest façade, once the home of the Benlliure family, conceals from view not only a beautiful interior (recently renovated) with stunning well-proportioned rooms on three floors, but one of the most remarkable collections from the Spanish Restoration period (1874-1931). Like Gaudi’s La Pedrera in Barcelona, Casa Benlliure strives to recreate the atmosphere of an upper middle class family at the turn of the 20th century. The living quarters reflect a period when shadowy rooms furnished with dark velvets, lace and ornate furniture were in vogue. It’s easy to stand motionless, gazing at the once cherished possessions that so deftly catch and hold your attention and be unaware of time passing. Jose Benlliure rose to prominence during the end of the 19th and beginning of the 20th century. 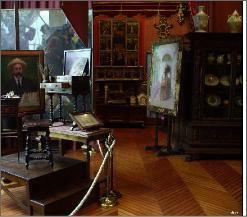 He spent much of his time in Italy before returning to Valencia, a well-known and respected artist. His style has been described as ‘academic classicism’ and he was an important influence in the region, best known for his portraits and historic pieces. His most interesting work, however, was of a different nature. Drawn by the metaphysical and the paranormal these pictures often contained scenes both menacing and fear-provoking. Sadly, much of his work is not on display at the museum. The national galleries and private collectors have taken the best examples and, whilst it’s possible to appreciate his style, those pieces on show do not adequately demonstrate his remarkable ability. However, if you’re sufficiently interested Museo de Belles Artes has one of his large metaphysical pieces in the hall. Throughout the museum the curators have put together a showcase not only of José Benlliure’s work but that of his son Peppino and his sculptor brother Mariano. There are also paintings by his friend Joaquin Sorolla together with works by Antonio Muñoz Degrain, Santiago Rusiñol and other well-known artists of the time. 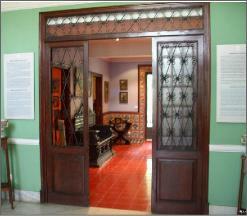 Yet this is not a house dedicated to art but to a group of artists, so take time to visit the small room on the first floor where there is a collection of Benlliure family photographs which give further insight into this most fascinating of Valencian families. Walking through the house I was struck by the lack of formality, the ease with which I was able not only to get close to those items that particularly interested me but to touch them. To open the drawers on a particularly fine desk, or to run my fingers over the small marble sculpture of a child’s head was most agreeable and gave me a greater sense of the past than if I’d been moved along from one cordoned off room to another by a bored guide. In fact, there were no guides and, surprisingly, no people apart from us. As we made our way through the rooms and up the ornate staircases I was unaware that the best was yet to come. Suddenly finding myself alone, I heard a door bang shut behind me and, as I turned, it opened a crack to reveal the face of one of my friends. His expression told me I was about to witness something exceptional. As I entered the room I gave an involuntary gasp. 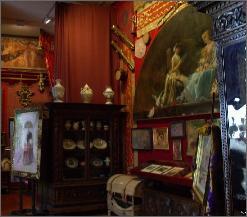 We were in Jose Benlliure’s studio; the room that houses his collection of antiques, ceramics and drawings. Weapons hang from the walls alongside musical instruments, paintings and sculptures. Sinister dolls in faded, dusty satin sit beside porcelain cups and crystal glasses - all as they had been left - to offer inspiration. The atmosphere of this wondrous room remains intact. Here is the heart of the house with its high ceilings and huge, elevated windows. Here can be felt the spirit of the Benlliure family. First Jose and his brother Mariano, then his son Jose Ortiz. Born in Rome and known as Peppino, Jose Ortiz painted his first oil in 1887 at the age of 6. In 1901 he was given an honorary mention at the National Exhibition for ‘Landscape of Valencia’. As a disciple of Sorolla, he accompanied him on his travels between 1909 and 1912, learning the techniques that would make him an award-winning artist in his own right. Considered by many to be the most talented, his posters were deemed both fresh and innovative. He died in Valencia in1916 from a lung infection at the age of 32, never realising his full potential. Jose’s brother, Mariano, a gifted modernist sculptor, used clay as his brother and nephew would use paint, achieving sensitive work that earned him First Medal of Honour at the Paris Exhibition in 1900. Between 1909 and 1910 he sculpted the head of the writer and photographer Blasco Ibañez, still on display in the city today. That same year he created the Monument to the Marquis de Campo in the Plaza de Canovas de Castillo. The top floor is given over to a rotating exhibition of local artists, so is worth a look although, on the day I went it contained a rather disappointing display of photographs; some of them very odd indeed. Finally, don’t miss the delightful Mediterranean garden. Planted by Jose, it has some fine statuary and ceramics. 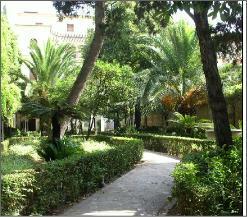 It was once used by Peppino as his studio, to provide a cool retreat from the hot Valencian summers. As we wandered through this calm oasis of mature shrubs, trees and fountains we came across a wonderful outside kitchen, the paella pans still hanging against the wall, as though ready for use. A well was set into one of the work surfaces and, in the shaded dining area, it was easy to imagine the Benlliure family sitting together, at rest after lunch on a summer’s day.